But it’s definitely time. I can always tell when I’ve just had it with my hair because I stop trying to do anything with it. I used to wear endless buns during this stage, but lately I’ve been sporting a braided ponytail nonstop. 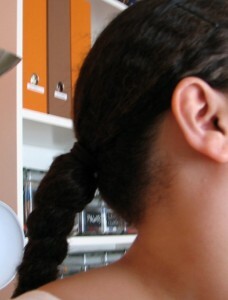 Easy, keeps all the hair from annoying me, and makes it very easy to detangle all this hair every morning. 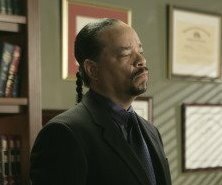 Until I realized last week that I have been sporting the exact same ‘do as Ice-T on Law and Order: SVU. This is not good. While I love SVU‘s Det. Odafin Tutuola (best named TV detective since Rico Tubbs on Miami Vice), I don’t need to emulate his personal style. So I’m ready for some hair to come off today. Ice-T as Det. Fin Tutuola. Me, with homemade Shakey Cam this morning. Agh!